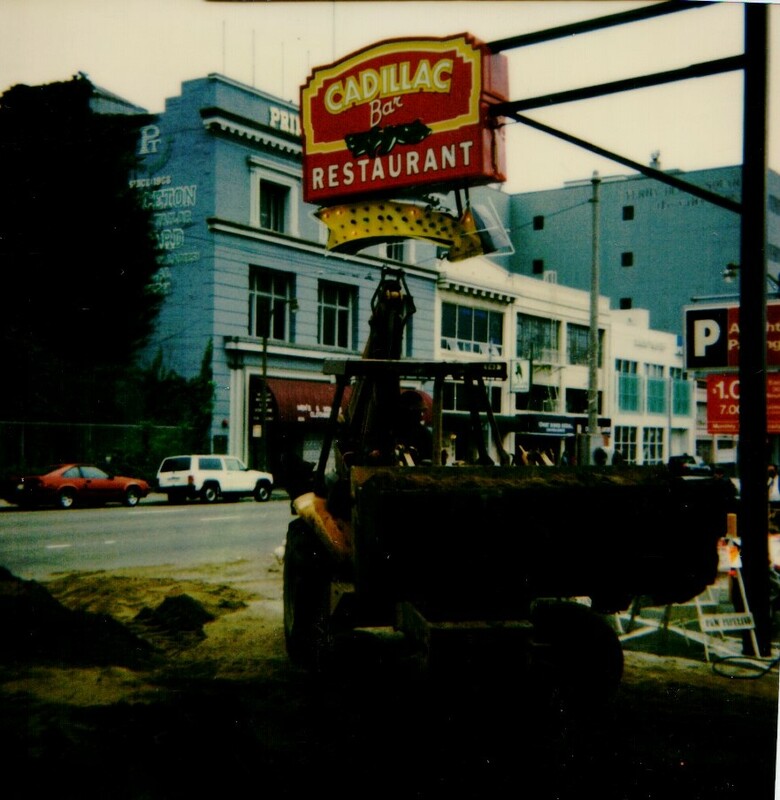 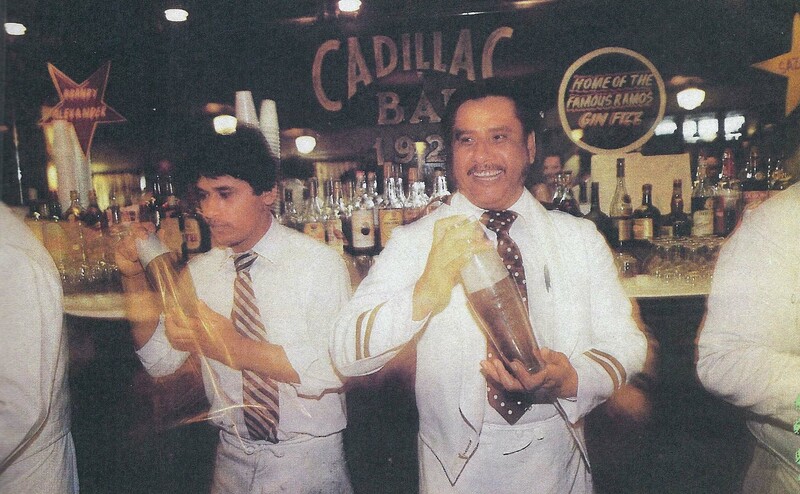 The San Francisco Cadillac Bar Restaurant is a legendary establishment. 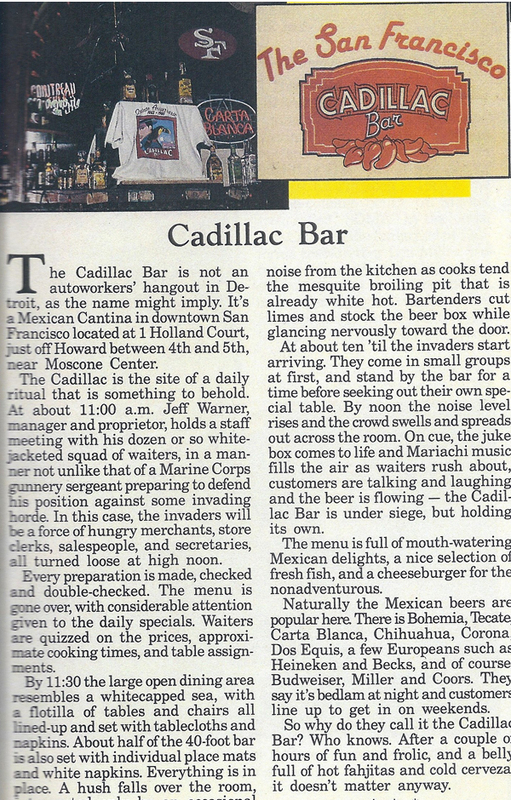 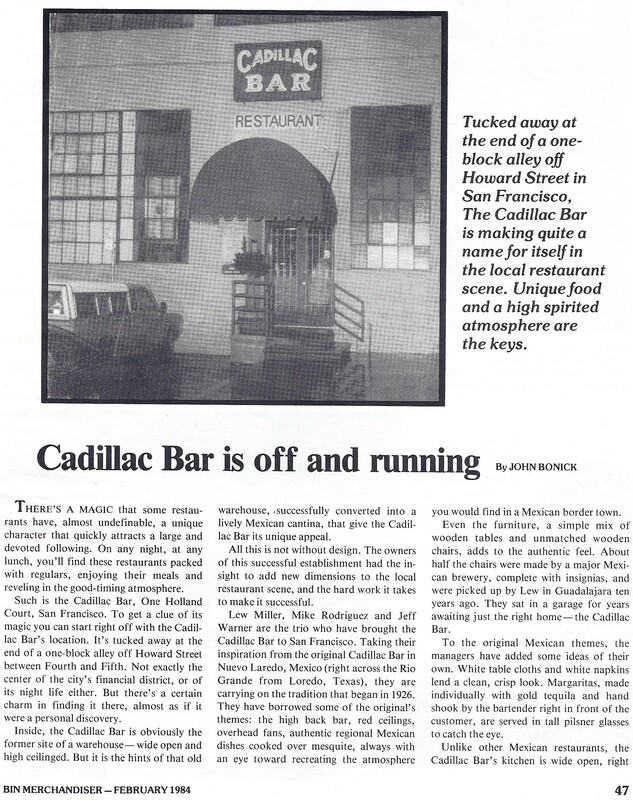 Its beginnings can be traced back to the original Mexican Cadillac Bar which opened in Nuevo Laredo, Mexico in 1926. 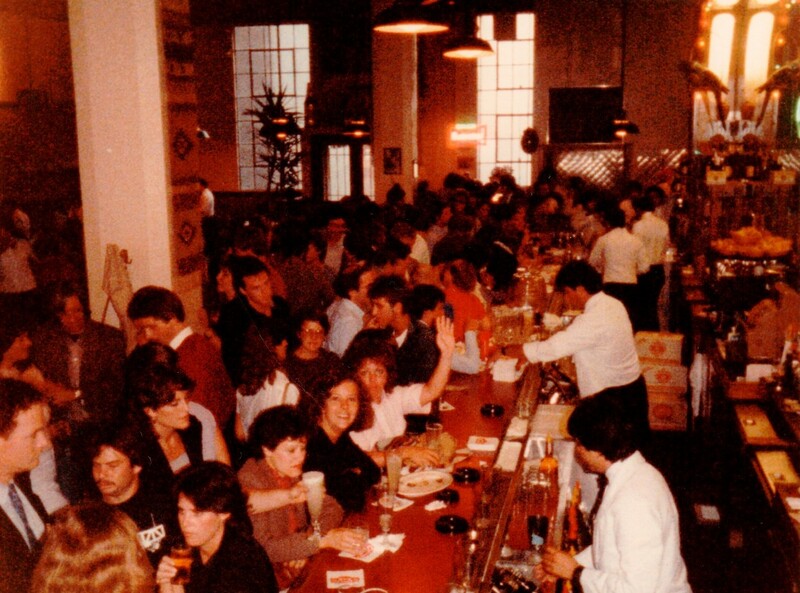 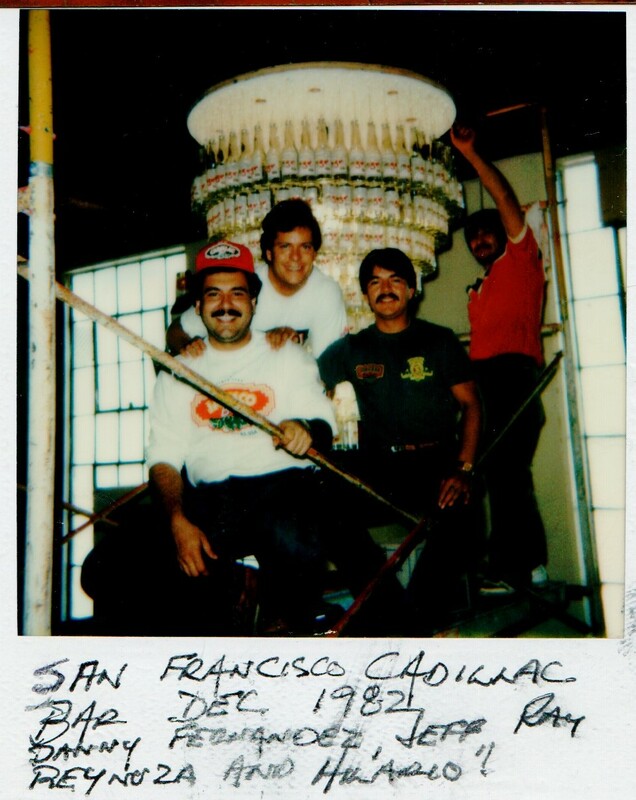 Back in the early 80's, several partners decided to bring this concept to San Francisco where they went to work and converted a warehouse into a restaurant in the South of Market neighborhood. 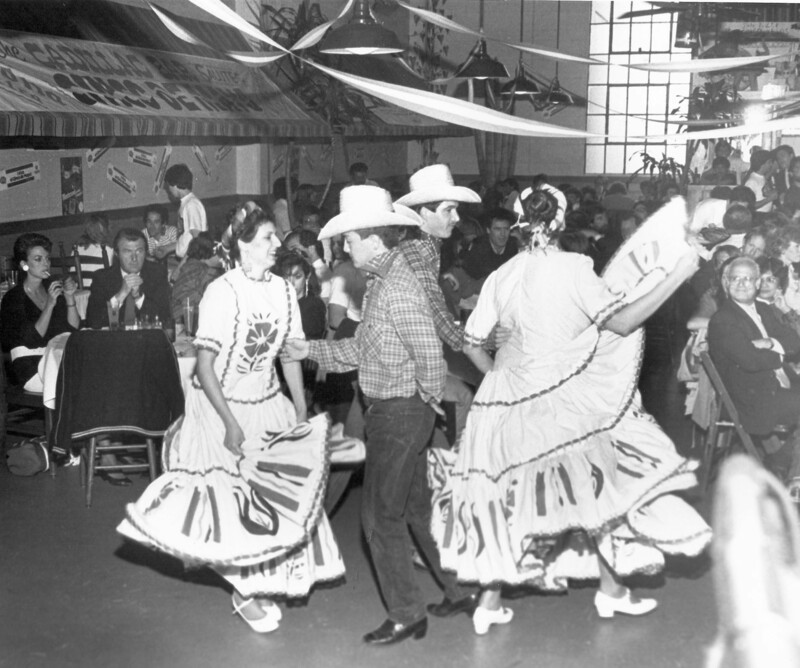 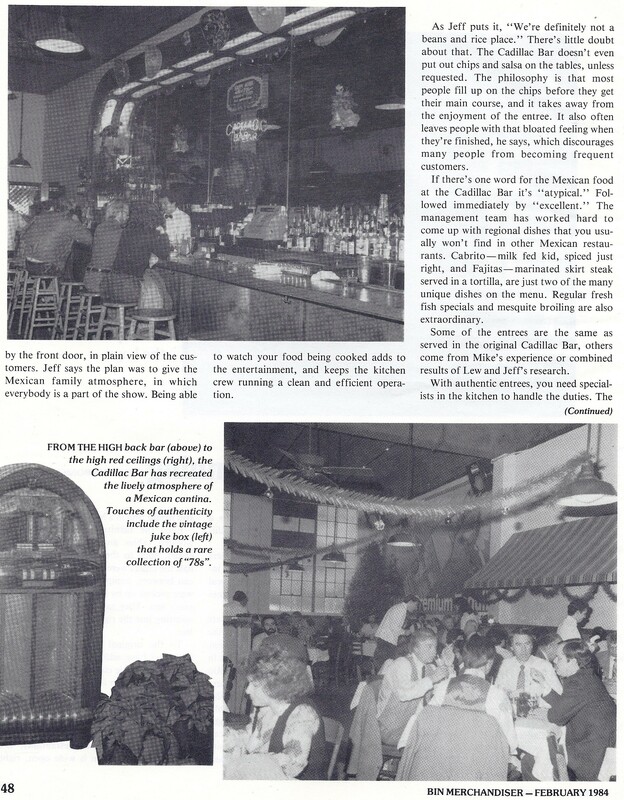 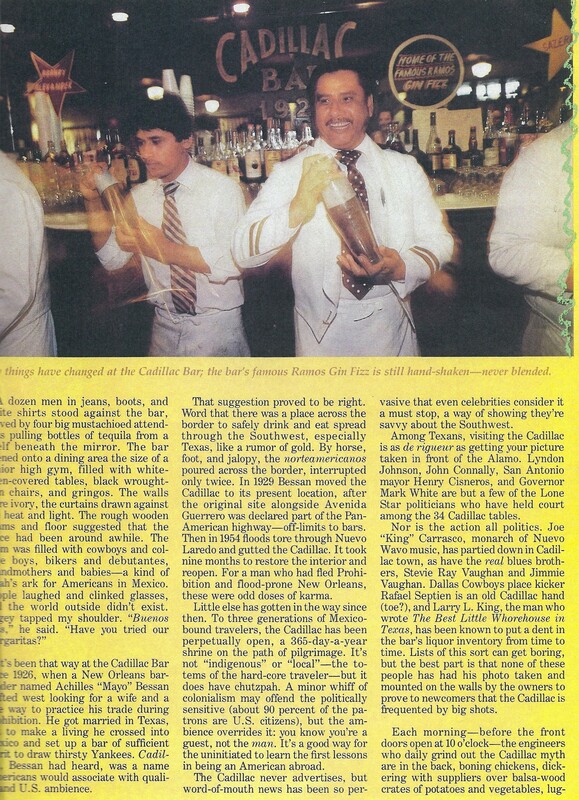 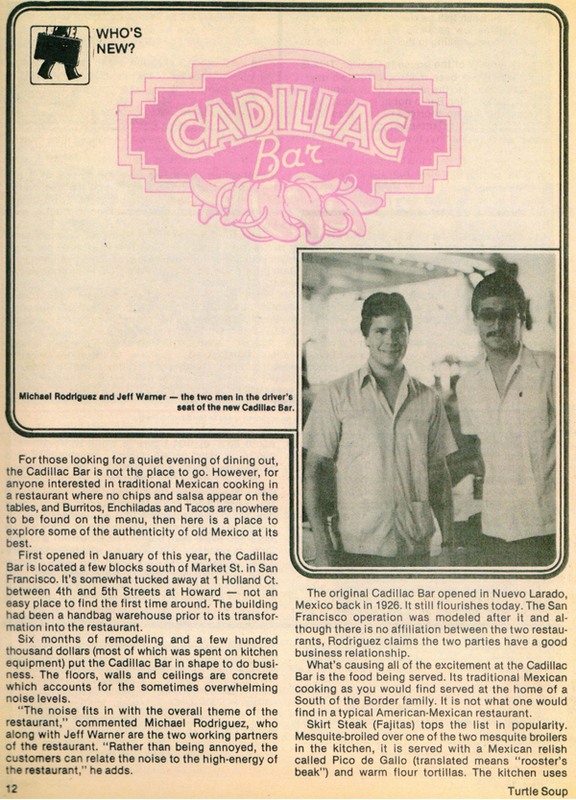 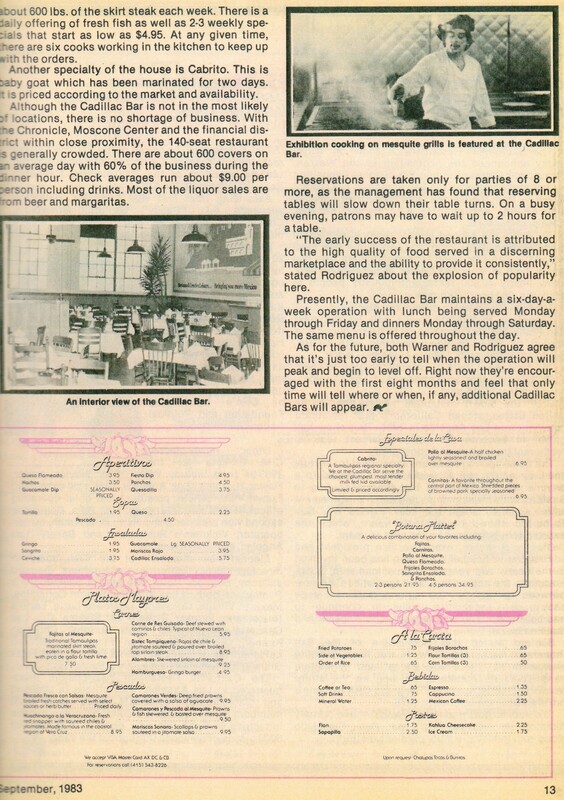 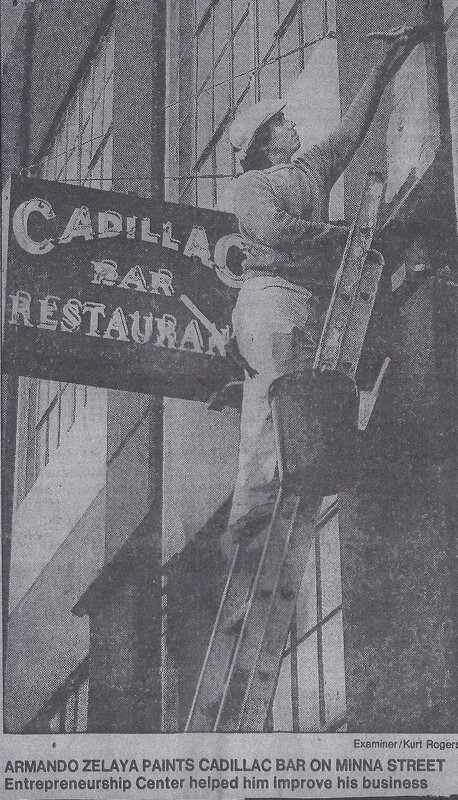 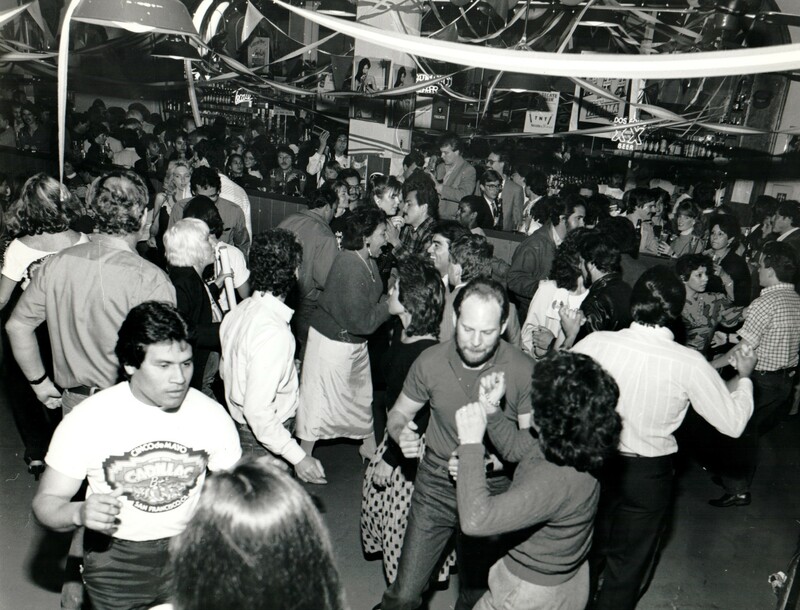 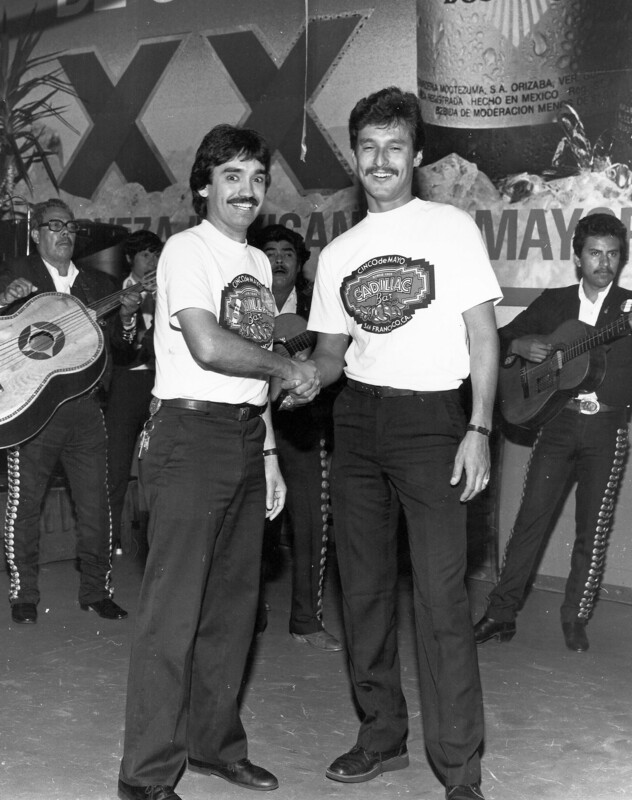 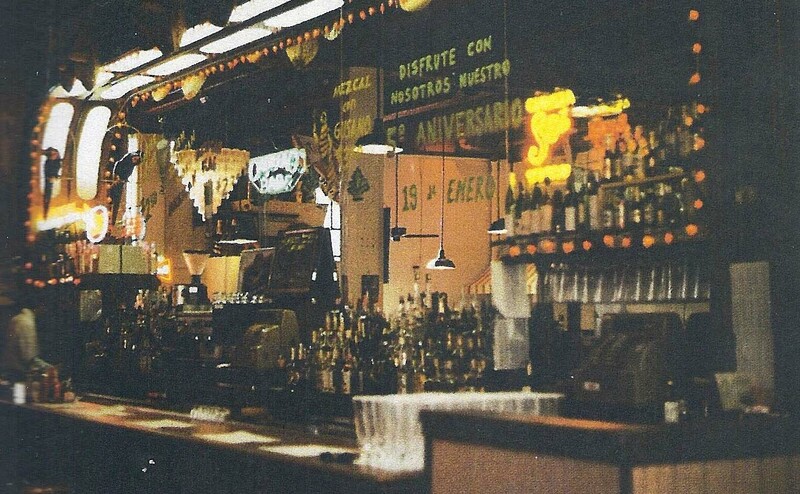 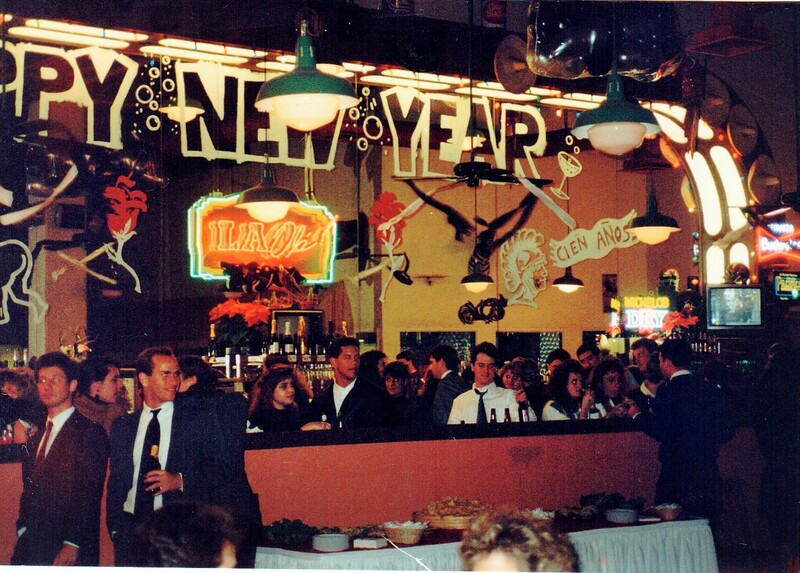 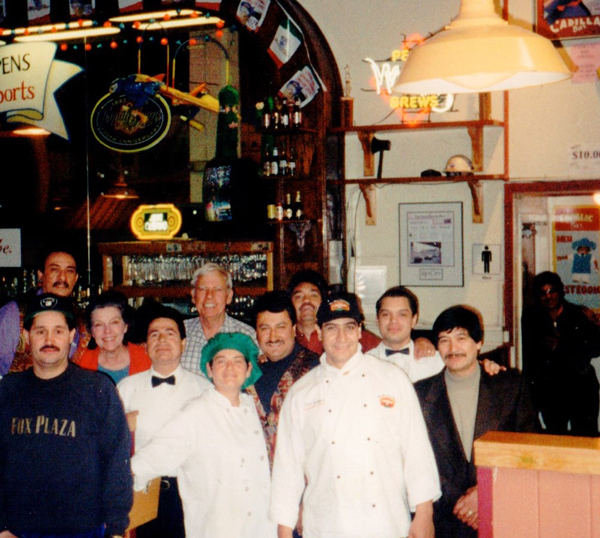 When they opened the doors in 1982, the partners made sure the restaurant had an authentic Mexican look including many features from the original Cadillac Bar such as the red painted ceilings, the high back bar, white linens on tables, and waiters and bartenders in white coats and bow ties. 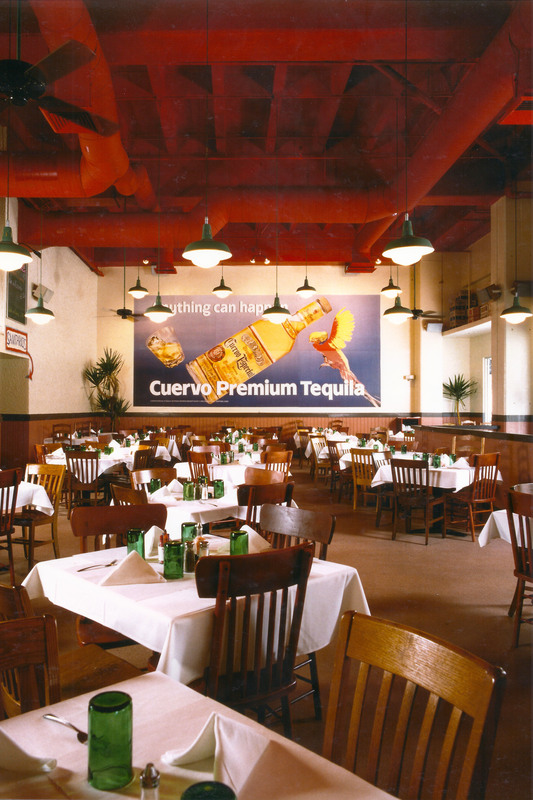 All these special touches were meant to make you feel like you were south of the border. 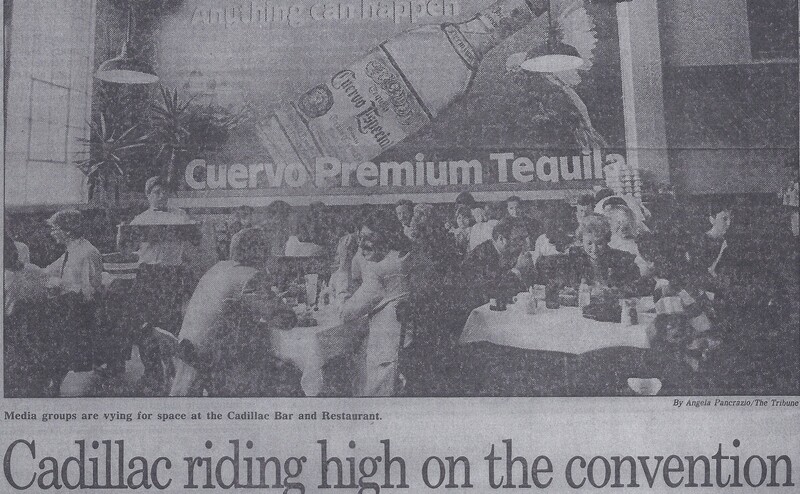 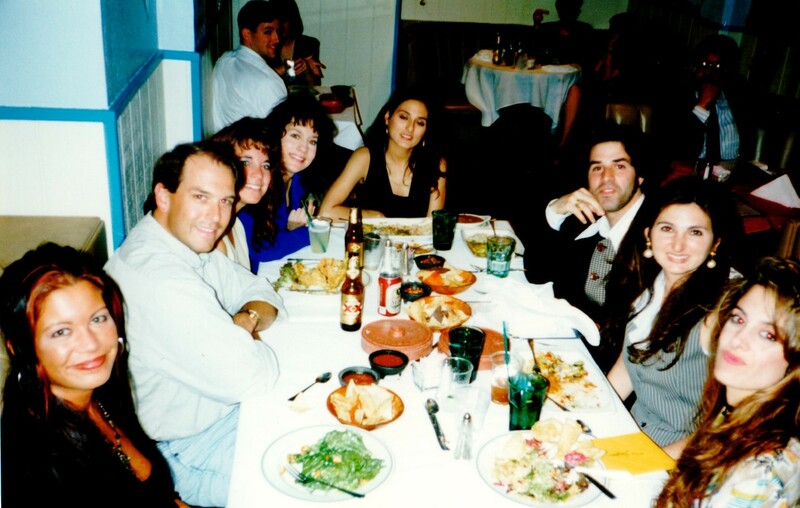 The partners ensured that the menu was authentic and house margaritas were always hand shaken. 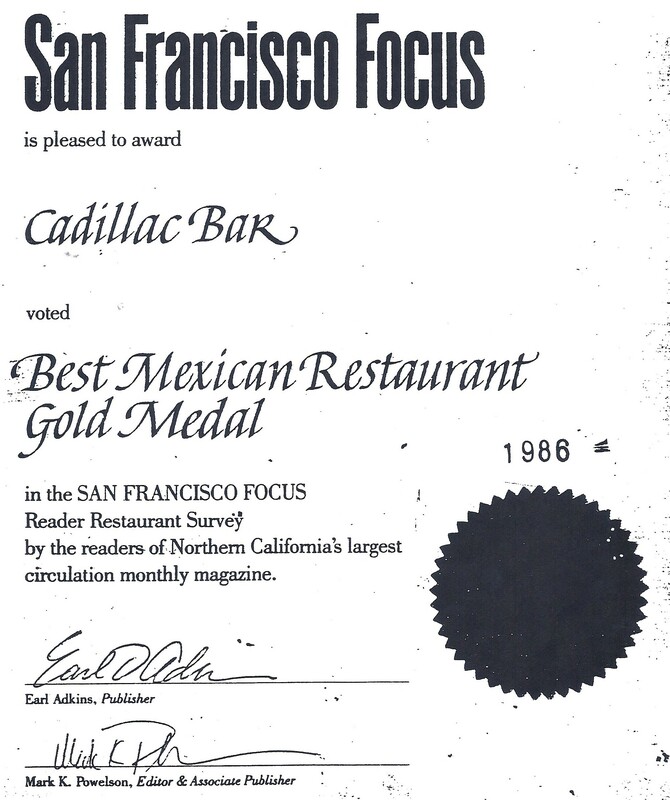 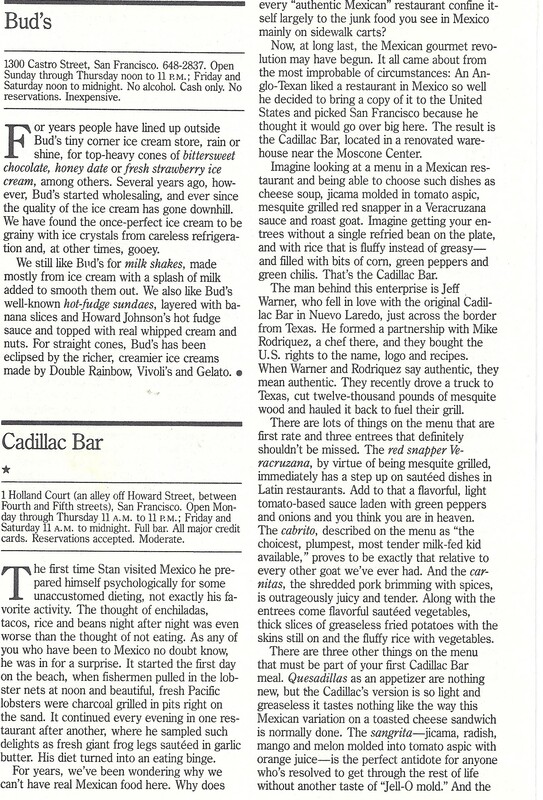 San Franciscans took notice and voted the Cadillac the best Mexican food restaurant in the city for many years. 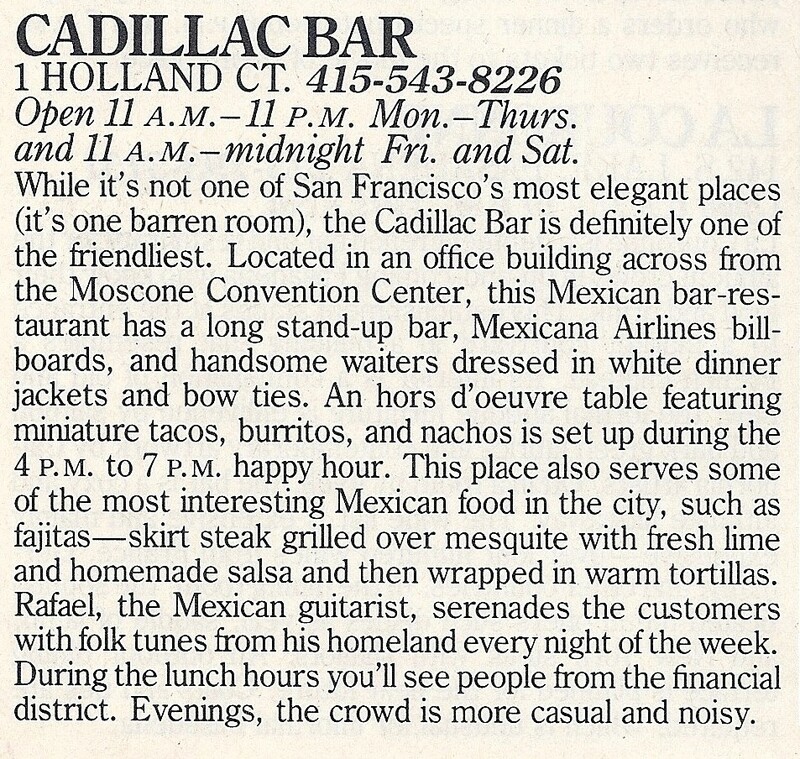 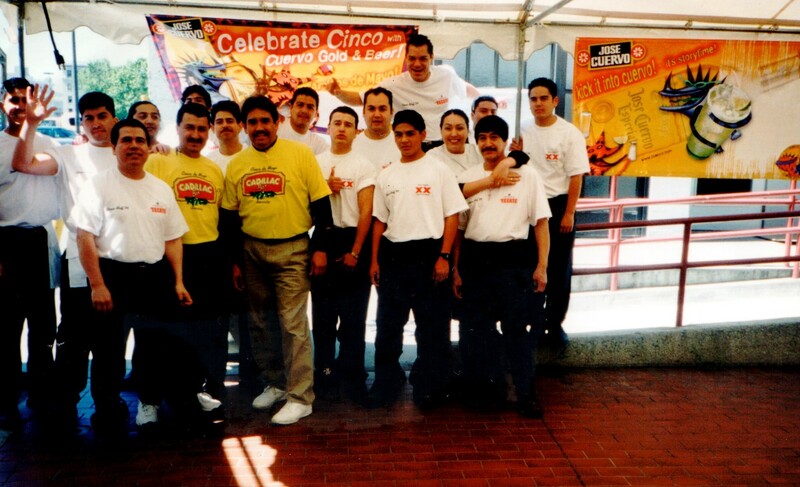 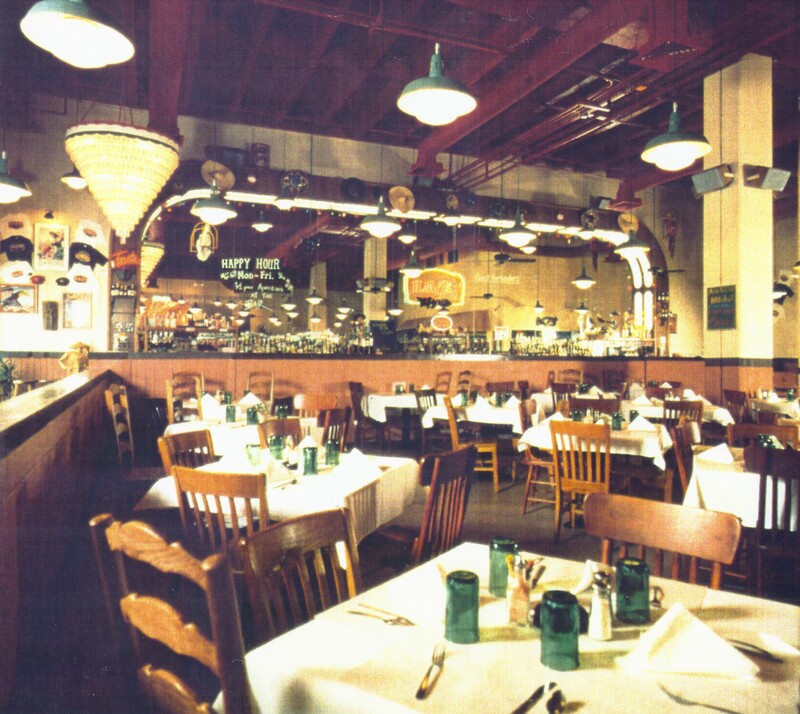 Unfortunately, in 1999 the restaurant was forced to close due to the expansion of the Moscone Convention Center. 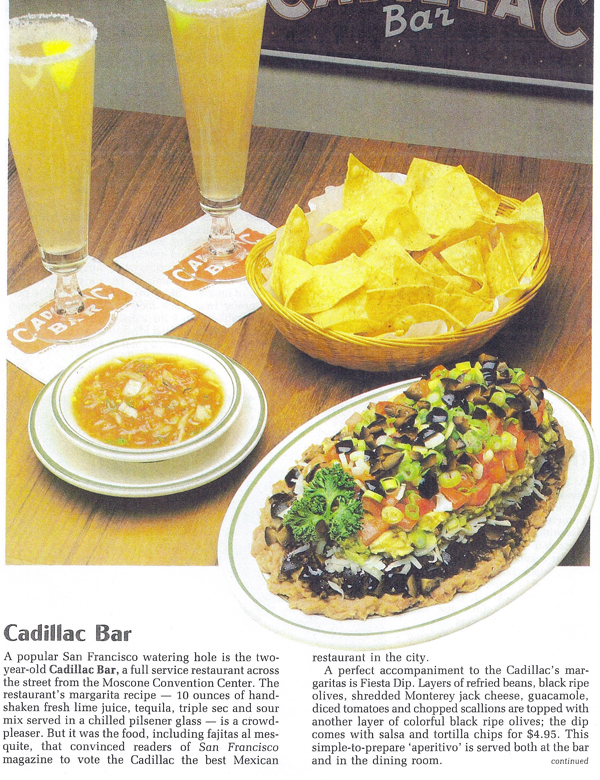 In 2012, one of the original founding partners decided to revive the Cadillac Bar and Grill in San Francisco with the goal of recreating that authentic Mexican restaurant with the same feel and look of its famous predecessor. 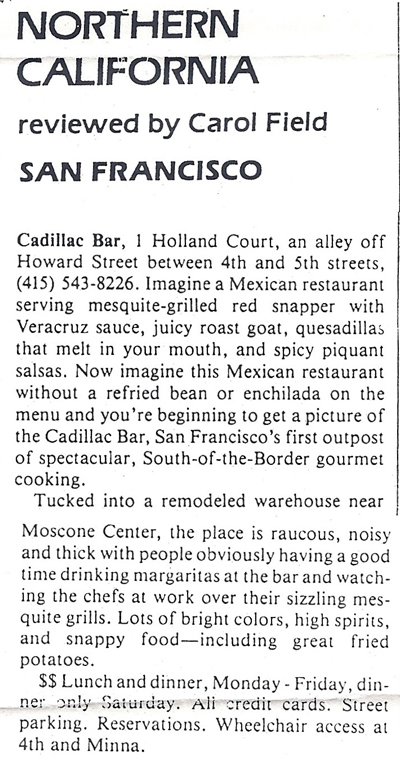 You won’t find reinvented Mexican food here — just great flavors and lots of fun.